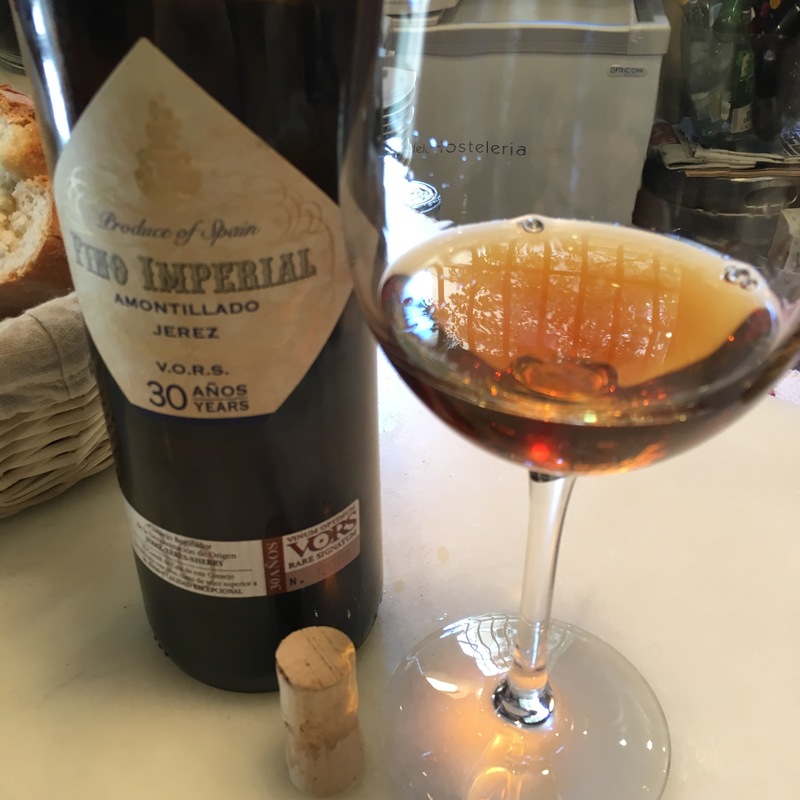 Not just any wines, either: you can come here and have a glass (or two) of truly special wines like this Fino Imperial, a 30+ year old VORS amontillado fino from Diez Merito. It has a pretty complete ficha: fruit from pagos that are classified as Jerez Superior (the precise pago is not identified, however), five years under flor then 25 years of oxidative ageing in a solera with five criaderas. It is a really beautiful colour – slightly reddish amber and seems to glow – beautiful the way the sunshine emanates from it. On the nose there is a touch of volatile (which I love in moderation) then caramel and hazelnut, and even vanilla, with maybe just a bit of residual hay bales at the end from those five years. Despite the volatile on the nose it doesn’t seem acidic on the palate: tingly more than zingy. A silky texture, in fact, pleasant caramel, hazelnut flavours first up then under cover of that silky caramel “old wine” notes of tobacco, wood and bitter walnut skin – all nicely balanced and a long slightly peppery finish. Smooth, elegant, tasty and spicey at the end. Really good. I’m relieved to read that I’m not the only fruitcake sitting in bars tallying up how many sherries (total and by type) are on offer! I only do it if it is really a good list! Hope you don’t mind me posting a few of these rarities on CellarTracker, using the photo, and if not, if I can score you on my personal Tracker as a critic worth following! Absolutely no problem at all – feel free. (If you could include a link or undertheflor.com that would be great but no biggy). I will, for anything that’s publicly visible. Thanks for your generosity.